I’ve been giving a number of presentations to executive and investors groups lately and one chart I compiled is perhaps one of the most interesting. Since I’m one of few how make an effort to track installed base of devices, I compiled a chart of all computing platform installed bases up to the current time period. Here is that chart. There is a great deal of interesting observations I tease out in this chart, however, I want to focus on just one for the time being. Note the green part of the chart labeling the PC installed base. If we were to go back to the 2008-2009 timeframe and prior, we note that the vast majority of people using computers were on just one computing platform, the PC. 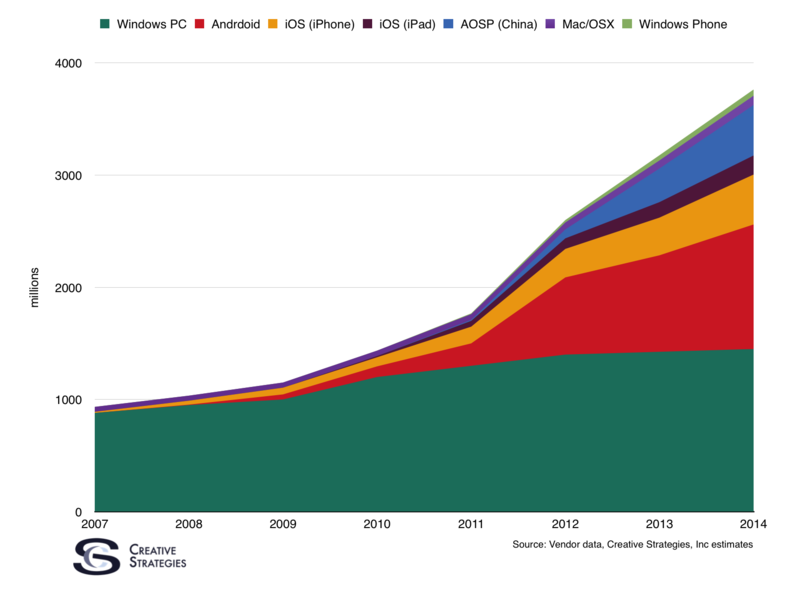 Windows dominated this computing platform as the Mac’s annual market share average for the 2000-2010 time frame was 3%. While we knew we had many hundreds of millions of people using PCs the only real customer base segmentation we could do was to look at the split between corporate and consumer PCs. It wasn’t until 2008 when more consumer PCs shipped each year than corporate ones. Meaning within a base of many hundred millions we had a number of corporate PC users and consumer PC users and that was roughly all we know. That was the best we could segment the market. We knew some, but overall very little about user behavior in the PC user base at that time. Fast forward to end of 2014 and the picture is quite different. The PC is not the only computing platform and now, thanks to smartphones, we have increased not only the number of computing devices but also the platforms as well. Why is this relevant. Look at the segmentation above the PC area of the graph. We have iOS, Google Android, and AOSP (non-Google Android) making up the vast majority of non-PC platform share. What is key about this observation is we know quite a bit about the behavior and even the economics of the nearly two billion people using one of those smartphone platforms. Fundamentally, what this more rich platform segmentation beyond the PC era has given us is a much deeper understanding of the behaviors of these platform customer bases than we ever had in the PC era. What has become glaringly clear is no customer base is the same in the three platforms which dominate computing usage today. iPhone customer behave quite differently than Android customers. The economics, and the opportunity within both platforms are quite different. Similarly, since AOSP (non-Google Android) is primarily in China and we have learned and observed how different the China market is from the US, it highlights completely different opportunities than those with iOS and Google Android. But the key point is we are able to track the sizes of these customer bases. Which means we have a much easier time than ever before in attempting market sizing. I joined Creative Strategies as an analyst to focus on consumer PC trends just before the dotcom bubble burst. I had been a part of several startups prior, and was briefed by many dotcom companies in my early days at Creative Strategies. Market sizing was one of the most difficult and often arbitrary tasks I observed startups attempt to do. Much of it had to do with such little knowledge of the behavior of the current PC user base at the time. Today this task has gotten a bit easier. If a company was to come to me today and articulate the type of customer they are going after, we can more cleanly estimate what the potential size of that market is by using our understanding of the different customers bases in each mobile platform and the behavioral differences within them. Companies would like to believe their potential target market is all of the mobile installed base, however, it is simply just not true. Given what we are seeing with the differences of the behavior of iOS, Google Android, and non-Google Android, I am becoming increasingly convinced the opportunities, and strategies, within each segment are quite different. There is no one sized fits all solution for mobile. To address each platform requires almost as much nuance as addressing different global markets due to cultural, economic, political, and other factors which make each region so much different than the others. No global company can take the same strategy to the US, China, India, Latin America, etc., and from what I see the same need to alter a company strategy/business model for each global region, is also applicable to each computing platform. Now that is a picture of the platform segmentation today but what about tomorrow? Here again this diagram of mine is helpful. 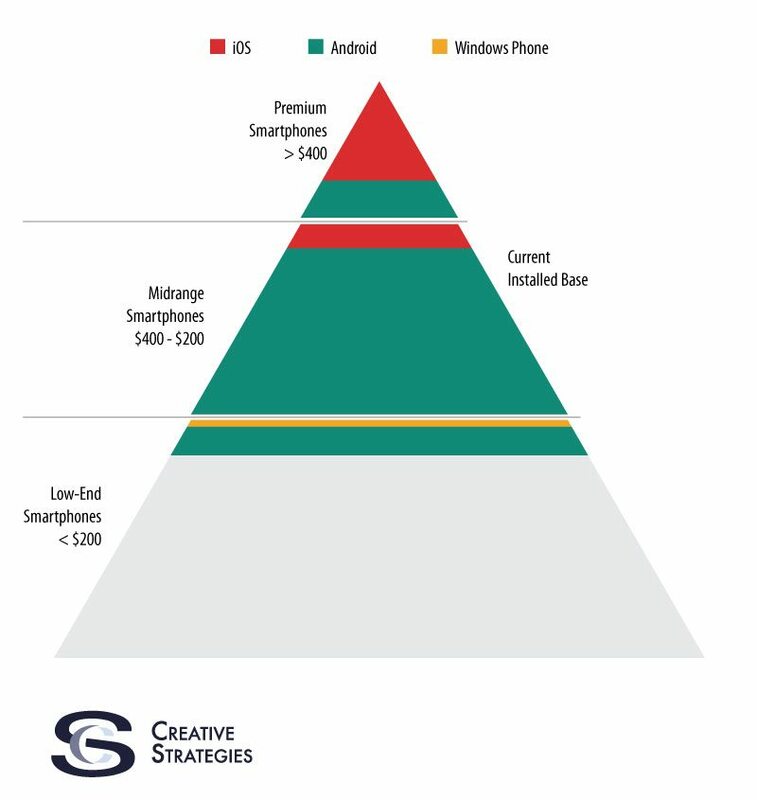 As we look to fill in the empty part of the diagram, will the Android customer base picture get clearer or more cloudy? If it is Google’s version of Android which dominates the market share in the below $200 phone segment then perhaps it may. However, if this diagram gets filled out with a variant of non-Google Android, perhaps a variant like Xiaomi, or Cyanogen, or something else, then we can continue to keep our platform segmentation into the next phase of mobile and seek to better understand the customer bases and the different opportunities within the different platforms taking share in the next billion users and beyond.